Workingman's Store Safety Shoe Truck - Bringing safety boots to your door. Safety Shoe Truck. Boot Mobile. Boot Truck. Shoe Truck. Whatever you call it, our Mobile Safety Unit gives your employees an opportunity for a more convenient shopping experience while ensuring they meet OHSA requirements for their safety footwear. If your company subsidizes its employees' safety footwear, let us show you what we can do for you. 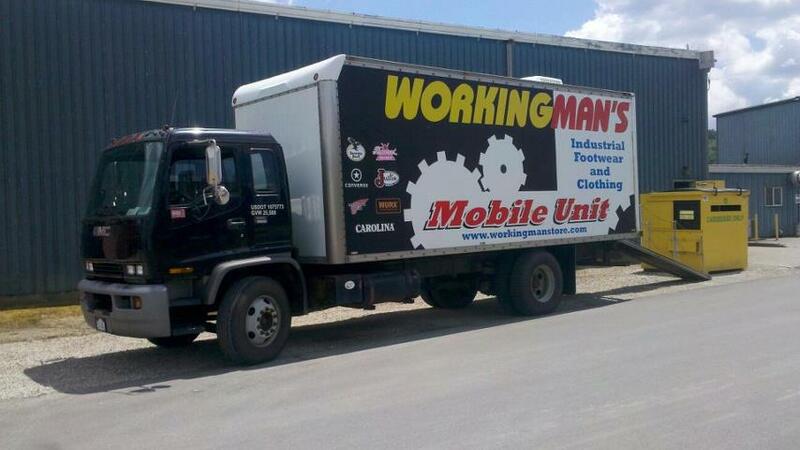 Our Mobile Unit is "A store to your door"! A Safety Shoe Program designed to take you out of the "shoe business"
Contact us at (740) 373-5648 or 800-215-9928 to schedule our Mobile Unit to your site. Check us out on Facebook & Twitter! We serve Ohio and West Virginia.